This is a guest post by Joshua Leatherman, a former book buyer for Family Christian Stores, a small business owner, communications strategist. You can read more on his blog or follow him on Twitter or Facebook. If you want to guest post on this blog, check out the guidelines here. A friend recently sent me a fascinating article on “batching.” After reading it, I became intrigued with the idea of dedicating blocks of time to similar tasks in order to decrease distraction and increase productivity. While there are variations of batching, the Pomodoro Technique seems to be well thought out and tested. There are also free tools and resources to get you started. Batching is simply a form of time management that allows a person to maximize concentration and decrease distraction. As a result, it increases your productivity, creativity, and mental sharpness, while decreasing fatigue, procrastination, and stress. Batch processing is the grouping of similar tasks that require similar resources in order to streamline their completion. Too many of us go through our day allowing distractions to dictate our activities. We’re in a constant state of reacting to the needs or interjections of those distractions (e.g., email, phone calls, text messages, voicemail, meetings, etc), However well-intentioned, we often allow the priorities of others to supersede our own. How often have you had a project or specific tasks that required time and focus but an email or phone call distracted you from accomplishing it? Working in a perpetual state of shifting tasks and refocusing attention creates fatigue, stress, and decreased productivity. Every time we become distracted, it takes an average of 15 minutes to regain complete focus. Unless you are intentionally managing your time, there is a very good chance that you operate in a constant state of unfocused response. If that’s the case, you are not being nearly as effective or productive as you could be and you’re simply not giving yourself, or your employer, your best (note: your best is not defined by how hard you work but by how smart you work). Batching minimizes the amount of distraction that’s placed on our increasingly connected lives. It not only protects us from the distractions of others, but also from our self-inflicted distractions. How many times have I seen an update on Twitter or Facebook from a friend that indicated they should be ______ (fill in the blank; writing a paper, editing, answering email, working on a project, cooking dinner, etc.)? Batching is setting aside an intentional amount of time for intentional tasks and making an intentional effort to not allow the distractions or interjections of others break that focus. After that block of time is up, take a planned break, then begin the next block of focused time. Each block of focused time is dedicated to one task or set of similar tasks. We are creatures of structure and habit; without it, we get stressed and fatigued. There’s a myth that (s)he who masters the practice of multi-tasking will be at the top of their game. It couldn’t be further from the truth. Study after study has shown that multi-tasking decreases productivity dramatically and drains one of creativity. The purpose of multi-tasking is reactive in nature—it’s the ability to adapt to tasks “on the fly” and to constantly shift focus from one task to another. Multi-tasking creates a convoluted and stressful environment that is eventually unsustainable. Left unchecked, you will drop balls lose your sanity. In an article for the the Harvard Business Review, Peter Bregman notes that our productivity goes down by 40% when we attempt to focus on several things at once. He notes that we are not really multi-tasking. Instead, we are rapidly switching from one task to another and interrupting our productivity. Plan and prioritize the tasks that need to be completed, by writing them down. Set a timer for for 25 minutes and devote that time to a task, or to a group of similar tasks. Larger tasks can be broken into multiple blocks or “pomodoro’s,” and smaller tasks (responding to email, returning phone calls, etc) can be grouped into a single block. After completing each Pomodoro, you put an “X” next to it and mark the number of times that you were distracted. After completing 4 pomodoro’s, take an extended 20 minute break. According to the Pomodoro website, you should see noticeable improvements in your productivity almost immediately and mastery of the technique in 7–20 days. And what about the name? Pomodoro means “tomato” in Italian. 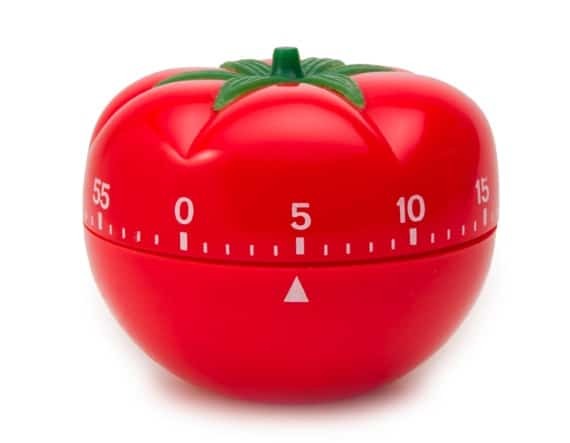 The inventor of the technique, Francesco Cirillo (Italian), initially used a tomato-shaped kitchen timer when he developed the technique. Question: Have you ever tried batching? What would it make possible for your productivity? You can leave a comment by clicking here.